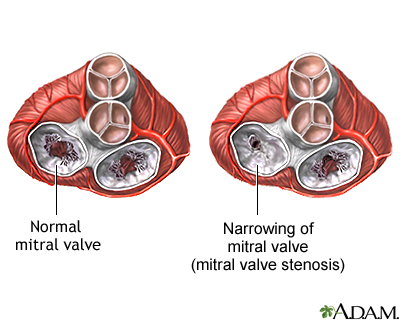 Mitral stenosis is a heart valve disorder that narrows or obstructs the mitral valve opening. Narrowing of the mitral valve prevents the valve from opening properly and obstructs the blood flow from the left atrium to the left ventricle. This can reduce the amount of blood that flows forward to the body. The main risk factor for mitral stenosis is a history of rheumatic fever but it may also be triggered by pregnancy or other stress on the body such as a respiratory infection, endocarditis, and other cardiac disorders.